For Sale: Up for sell is a package deal of the PlayStation VR system. It was all opened but never used! 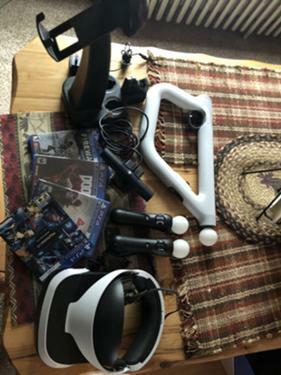 Comes with headset and all wiring plus ear phones, camera with stand, headset and controller charging stand, two motion controllers, and VR motion aim gun contrite and also four games( demo disc games, doom vfr, firewall zero hour, and Farpoint). Asking $400 for whole package. Over a $700 value bought in store! Text or call (814)-592-2537 if interested!